David Flitcroft has today bolstered his attacking options at Mansfield Town for next season with the signings of Tyler Walker, Otis Khan and Craig Davies. Highly-rated forward Walker, 21, has joined Mansfield on a season-long loan from Nottingham Forest while attacking midfielder Khan, 22, and experienced striker Davies, 32, have both signed two-year deals. Stags chief executive officer Carolyn Radford was “thrilled” to get the three deals done after much hard work, which saw undisclosed fees paid to Yeovil Town and Oldham Athletic for the services of Khan and Davies respectively. She said: “We’ve had to remain patient and professional in equal measure but we know these signings will excite our supporters and add real quality to our squad. 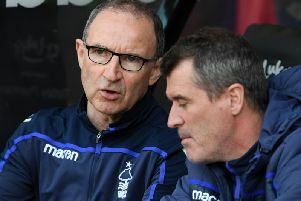 “Tyler’s loan transfer has come as a result of a new, special relationship with Nottingham Forest and their owners, who I thank for their characteristic professionalism. We have agreed to pay a contribution to the player’s wages and our ambition is to aid Tyler’s development while he plays a significant part in our season this term. Walker, son of Forest legend Des, made 33 appearances in total for Forest in the Championship, largely from the substitutes’ bench, since making his debut for the Reds in March 2015. He has had spells at Burton Albion, Stevenage, Port Vale and Bolton Wanderers over the last two seasons and will be aiming to gain as much first team experience as possible at the One Call Stadium. While Stags beat off stiff competition for 22-year-old Khan with rumoured interest from Preston North End, Wigan and Shrewsbury emerging earlier this week. Khan began his career at Manchester United before joining Sheffield United’s academy, where he made two first team appearances, and went on to play for Buxton, Matlock Town and Barrow on loan. He joined Barnsley in January 2016 before moving to Yeovil that summer and has gone on to make 67 appearances for the Glovers during that time, scoring 22 goals in the process. And much-travelled former Wales international Davies netted 14 times for his previous club Oldham, who were recently relegated from League One. Amongst other clubs in a career which started at Manchester City, he has played for Brighton, Chesterfield, Barnsley, Bolton and Wigan in the past eight years. Stags boss Flitcroft added: “There’s been a lot of hard miles and real hard graft put into these deals and I’m delighted for everyone at the club and thank the chairman and Carolyn for their support in making these signings happen. “I’ve not been deterred from my vision of what the team will look like and what it will represent to our supporters and I’m absolutely delighted with the signings, especially before the Portugal training camp next week.